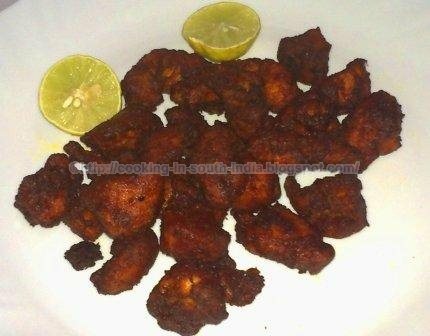 Chicken 65 is a spicy deep fried chicken basically from Chinese origin but here I am going to prepare Chicken 65 in South Indian style ,We can make Chicken 65 either with both Bone and Boneless Chicken. Wash and Cut the Chicken in medium size pieces, marinate the Chicken with egg, turmeric, red chilli powder, ginger garlic paste,curry powder,lemon juice,all purpose flour,onion paste,food colour and Corn flour. Take one medium sized onion grind into smooth paste without adding water it well give nice texture and taste to the chicken. Mix it well then keep it aside for at least an hour (or) refrigerate it for 30 Minutes. In a fry pan add oil and heat it. Deep fry the chicken until became fully cooked and brown in color.